Proper site preparation is critical to establishing willow bioenergy crops. Young willow plants require a prepared soil and thorough control of competing vegetation for willow to achieve optimal growth rates and quickly become the dominant species on a site. The protocols in this fact sheet summarize the tasks required for converting idle fields or pasture to willow. 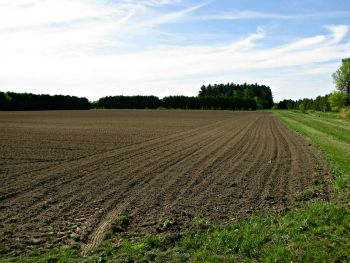 Sites recently used for row crops will require less intensive site preparation. Tasks are identified as 1.1 (year and task number) and so forth, and correspond to the Willow Calendar fact sheet (available at www.esf.edu/willow) which provides an overview of all tasks throughout the life cycle of a willow bioenergy crop through multiple harvests. Site preparation should begin at least one full year before planting. Waiting until the spring that planting will occur to start site preparation increases the chances that critical tasks will be skipped, wet conditions will cause delays, planting will occur too late in the season, and thorough control of perennial weeds common on idle land will be difficult or impossible. Poor site preparation can lead to low plant density, delays in the first harvest, lower biomass yield, or failure of the crop. Timing and sequence is important in many tasks such as herbicide application. Tasks should not be conducted in compressed time frames or when the weather or other factors are less than optimal. Proper site preparation will make subsequent management of the willow crop easier, and the densely planted willow will form a closed canopy by the second or third growing season. This closed canopy provides natural control of competing vegetation through shading, and maintenance tasks throughout the remainder of the crop’s life cycle (20+ years) are minimal. Each field is unique, and site assessment is an important task to inform decision making. The condition of the field will determine the specific site preparation tasks needed, and several factors must be considered. The type, maturity and quantity of existing vegetation on a site will dictate the specific weed control tasks. NRCS soil maps can provide information about the native soil layers, depth, texture and drainage. The plow layer will differ from the native soil after years of various management activities. Soil sampling to assess fertility, organic matter, pH and other factors is recommended (see Nutrient Management fact sheet), and local knowledge of fields should be consulted whenever possible. Operational limits of the site such as access, slope, hedgerows, or other divisions between fields may impact tillable acreage, field size and layout. Refer to the Site Selection fact sheet for more information on how to decide if a site will support willow and the factors that may limit production, yield and revenues. After site assessment, create a plan and specific timeline for establishing the crop to ensure that the necessary tasks are all conducted, and in the proper sequence. The plan should be detailed and include all the machinery, materials and actions required. Informed planning will reduce delays and unexpected challenges during site preparation, planting and maintenance of the crop. Refer to the Penn State University Safety and Health Management Planning for Biomass Producers guidebook for comprehensive safety protocols (http://extension.psu.edu/publications/agrs134) and incorporate the appropriate safety measures into the establishment plan and implementation process. Some site improvement steps may need to be taken at the outset, such as improving site access, modifying hedgerows, improving surface drainage, etc. Willow can tolerate wet soils but will not survive or produce substantial biomass in areas with prolonged presence of standing water. Harvesting commercial-scale willow requires a forage harvester and chip collection vehicles (trucks or tractors), so headlands and roads within fields must be able to support these activities during fall, winter and spring. Willow is ideally harvested in the dormant season on frozen ground with little or no snow, but these optimal conditions do not always occur in harvest periods. 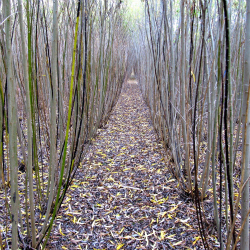 Willow is a pioneer species that will not compete well with other vegetation while the unrooted willow cuttings expend stored resources to grow new roots and stems during the first and second growing seasons. Willow plants must be given the competitive advantage that comes with thorough site preparation and weed control. The first task in this process is to mow vegetation taller than one foot, brush hog old fields, etc. Remove large quantities of biomass by baling so that the remaining vegetation can regrow and be sprayed with herbicide to kill it. Grind or remove woody stumps greater than four inches in diameter from cleared old fields. Once the cut vegetation has resumed vigorous regrowth (one to two weeks, or several inches of new growth) apply a broad-spectrum contact herbicide, or mix of herbicides. Weeds must be actively growing above ground for contact herbicide to be effective. Key factors in assessing vegetation and choosing appropriate herbicides include the prevalence and ratios of specific species, annuals versus perennials, grasses versus broadleaf species, the method of self-propagation, difficulty of control, and time of year. For example, a field with primarily annual weeds that have not yet gone to seed will be easier to control than a field dominated by a mixture of aggressive perennial weeds that self-propagate from underground rhizomes. Consult an herbicide expert for guidance and follow the manufacturer’s instructions on the label. Assess the effectiveness of herbicide treatments about two weeks after application. Effective control is indicated by brown vegetation above ground and dead roots/rhizomes below ground. Reapply the same or a modified herbicide mixture across the whole field, or in spot applications, as necessary. If live rhizomes are found below ground, wait a few weeks until they produce leaves before applying herbicide again. If reapplying herbicides, wait an additional two to three weeks for the herbicides to work before proceeding to the next steps. After vegetation has been cleared and effective herbicide kill is confirmed, add amendments as necessary based on soil tests to adjust soil pH to the 6.0 – 7.0 range. Fertilizers, if needed, are applied in spring of the second growing season after the willow is coppiced (cut back). Willow requires a reasonable soil volume soil for optimal root development and aboveground growth. If a root-restricting hardpan exists 18 inches or less below the surface, break up the hardpan with a tractor-mounted ripper or sub-soiler. Use a moldboard plow to turn soil, break up surface compaction and sod layers, and incorporate pH amendments and organic matter. Zone (conservation) tillage is an alternative site preparation method that may be a viable option in some cases. More information on zone tillage is available from Cornell University Willopedia: (http://willow.cals.cornell.edu). To break down and smooth out the plow furrow, further incorporate organic matter, and improve soil tilth, discing is performed after plowing. This may require multiple passes depending on specific field conditions. The goal is to create a smooth and homogenous planting bed. Fields with a high percentage of rocks four inches in diameter or greater should be combed using a rock-picker tractor attachment (Figure 5) because rocks could damage willow planting and harvesting equipment. Picked rocks should be taken off site if possible. If dumping rocks in a side or corner of the field, make sure the rock piles are in locations that will not interfere with headland mowing and turning of harvesting equipment. Two to three weeks after discing, visually assess regrowth of competing vegetation and the efficacy of weed control across the field. Reapply contact herbicide again if competing vegetation is present on over 25% of the land area. Plowing and discing fields will unearth dormant seed beds that may require further controls. Spot applications and herbicide mixes for specific species may be appropriate. If large amounts of weed regrowth persists (>50% of land area), mechanical and chemical weed control should be continued into the spring before planting. Combinations of discing or cultivators (i.e. spring tooth harrow), and herbicide applications are options at this stage to manage particularly weedy sites. If weed control is determined to be adequate by September before plan-ting, a cool-season grass such as winter rye should be planted as a cover crop. The total potential for soil erosion over the life cycle of a willow crop is very low relative to annual crops. Willow is a perennial plant with a fibrous root system, but the potential for erosion is greatest in the first two years when the root system is still being established. In addition to reducing erosion potential, the cover crop will provide additional weed control through the first growing season. The cover crop will inhibit other species establishing on the site and can be easily terminated using a roller crimper or mower before planting willow. The dead vegetation will act as a mulch layer. Willow is planted in spring of the second year. Completing all the tasks described here the previous year will result in a well-prepared soil and little to no competing vegetation. The effectiveness of each task should be confirmed before moving to the next task. The number of times each task or set of tasks is preformed may be modified based on site conditions (for example, rock picking and discing may be an alternating activity on rocky sites). Proper site preparation and control of competing vegetation sets the stage for successful crop establishment, minimal maintenance in future years, and the first harvest three to four years after coppice. More information is provided in the next fact sheets on Planting and Maintenance. Justin P. Heavey and Timothy A. Volk. © 2015 The Research Foundation for the State University of New York College of Environmental Science and Forestry. This work was supported by the New York State Energy Research and Development Authority (NYSERDA), the US Department of Energy (USDOE) and the US Department of Agriculture National Institute of Food and Agriculture (USDA NIFA). No funding agencies, SUNY, nor any of their employees makes any warranty, express or implied, or assumes any legal responsibility for the completeness, accuracy, or usefulness of any information or process disclosed here.